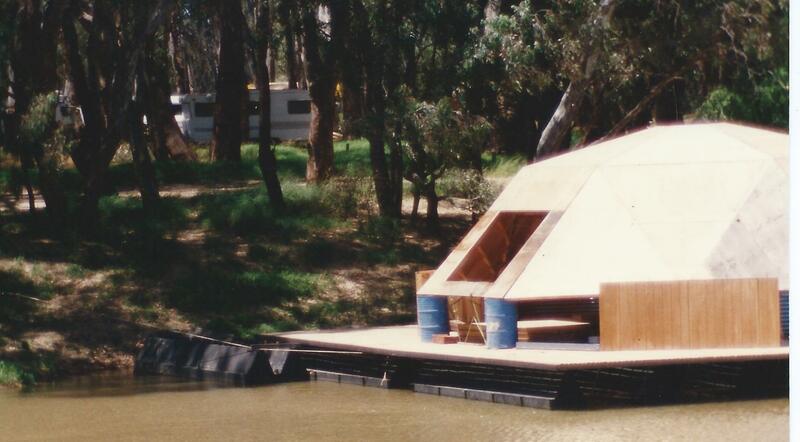 Mr SMALL (Murray) [4.20]: I seek to talk about a development on waterways, in this case a boatel on the Murray River at the township of Barham within my electorate. The construction of a floating motel on the river waters is creating problems for and concern to many people in the area. 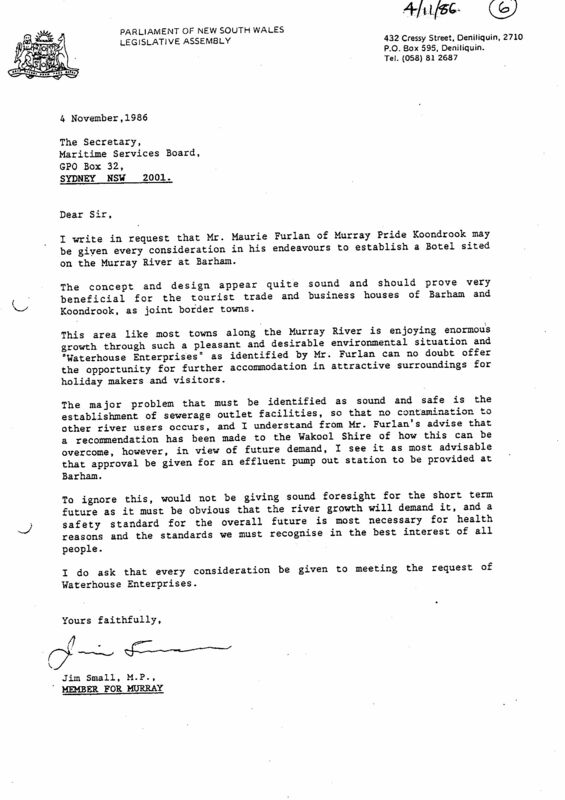 A formal application, which I was requested to support, was made to the Wakool shire council in early 1987 in the name of Waterhouse Enterprises. 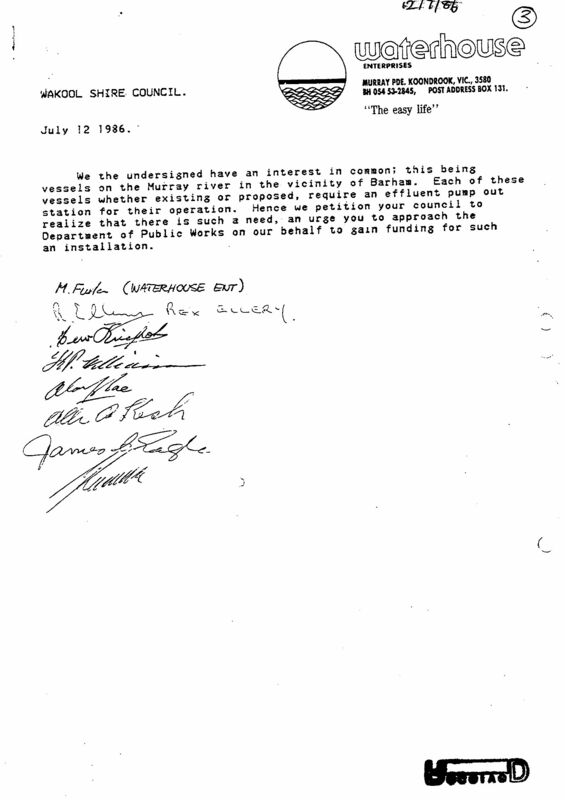 Note - He wrote in support of Botel. At the time the application was made I took the matter up with the Minister. The development is on the New South Wales side of the Murray River, upstream of the town of Barham, along a beautiful sandbar. At that point the Murray is very narrow. Note - The river there was very wide and the sandbar was small and muddy. The boatel is designed to contain 15 floating units on seven pontoons located on each side of the central recreation and house type unit. Being upstream of the town, the development will endanger the town's water supply by polluting and contaminating it. It will be necessary for the boatel development to be connected to a sewage disposal depot. Since the local people have realized the consequences of this type of facility being built they have raised many objections to it. Note - Council had called for a houseboat waste pump-out since the arrival of 'Shady Lady' hire houseboat in 1985. We organised a local petition for council to provide it. We offered to build and operate it at no cost to council. The Barham Progress Association has come out strongly against the development since it was started, expressing the worries of the citizens of the town. The Murray Valley Water Diverters Association has objected to the proposal. The Murray Valley League and the Murray-Darling Basin Commission have objected to the proposal. The local public have presented a petition bearing 270 signatures against the proposal. 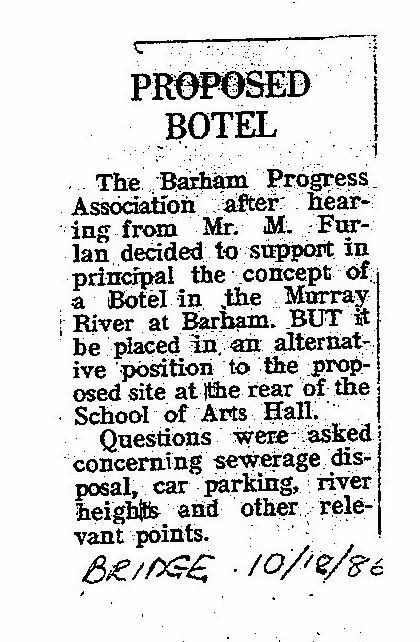 Note - The Association supported the Botel at Barham. The committee did not want it behind the School of Arts Hall. Jack Keck, (Treasurer) owned the Shady Lady and her passengers embarked there. After all the protests that the Wakool shire council has received, it has now called for an environmental impact study and as Waterhouse Enterprises has not already undertaken such a study, the council now opposes the development. Note - Many studies were called for and provided. Crown Lands promised to have Council make them public. They were kept secret. This link takes you to a study by our own Town Planners, Mitsch and Veitch. Together with our solicitors Morrison and Sawers; they betrayed us and sided with government. The application, if implemented, would create a precedent. Nowhere on the Murray River is there such a floating vessel permanently anchored in one spot. As I mentioned, this is a very narrow section of the river. If it had been located further down the river where there are small weirs and the watercourse is broad, it would not cause such a serious problem. The proposed development, in its present location, would clearly block a fair proportion of the river and could create problems for other users. I am disappointed that at this stage the Maritime Services Board has not objected to the structure. I suppose there is provision for granting a marine licence to permit the anchoring of a large vessel or houseboat or similar watercraft, but the only construction undertaken by the developer so far is in the form of pontoons, which are floating vessels. Structures are to be placed on these pontoons to provide accommodation. Note - The vessels were well beyond pontoon stage. By the time parliament was informed they would have been erected had Council not blockaded the area. I am pleased that the Minister for Administrative Services and Assistant Minister for Transport is at the table, for I know he understands the area, having previously been Minister for Water Resources. Mr DEPUTY-SPEAKER: Order! The honourable member has exhausted his time for speaking. Mr SINGLETON (Coffs Harbour), Minister for Administrative Services and Assistant Minister for Transport [4.25]: I understand the problem that the honourable member for Murray has raised. He is well known in his electorate for the tremendous service that he gives to it. That was well illustrated at the last election, at which he was the top scorer in the State, polling 78 per cent of the votes. That indicates how well he knows and represents his electorate. 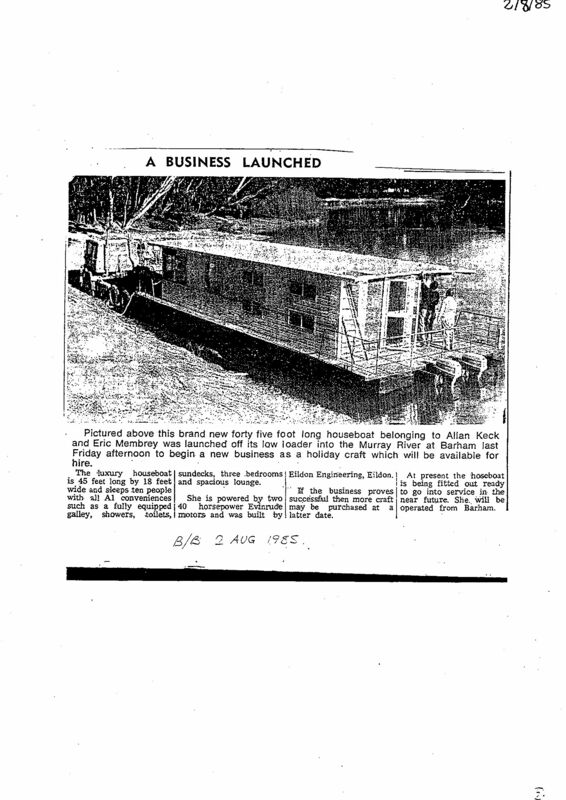 The development to which he referred is in essence a floating motel in the Murray River. I shall certainly ask the Maritime Services Board to look at the matter as it relates to the construction in question. I shall also make sure that the health authorities monitor the position. There may be a need to stop the construction or move the floating motel downstream, as the honourable member suggested. Probably the Minister for Planning should also be advised of the matter as it is obviously a new type of development. A matter that the honourable member did not mention is the effect that the development could have on riverbank erosion in the Murray, which is a serious and continuing problem along that river. A large boat or floating motel fixed at one location could affect the flow of the river, redirect currents, and ultimately have a serious detrimental effect on riverbank erosion. I thank the honourable member for bringing the matter to the attention of the House and assure him that every effort will be made to overcome the problem that he has raised.